Physical activity is recognized as one of the most effective measures to reduce risk of injury and to improve the quality of life in elderly. Many of the elderly however lack the motivation, confidence and skills to engage in regular exercise activity. One of the promising approaches is semi-automated coaching that combines exercise monitoring and interaction with a health coach. To gain a better understanding of the needs and challenges faced by the elderly when using such systems, we developed Kinect-based interactive exercise system to encourage healthy behavior and increase motivation to exercise. We present the multi-disciplinary design process and evaluation of the developed system in a home environment where various real-world challenges had to be overcome. F. Ofli is now with Qatar Computing Research Institute (QCRI), Doha, Qatar. 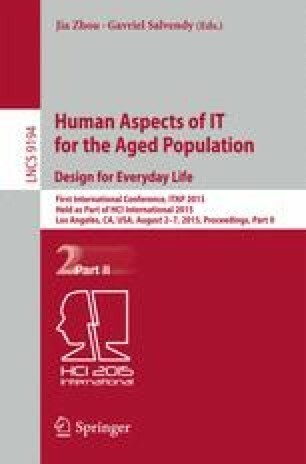 The authors would like to thank Štěpán Obdržálek, Alex Triana, and Kavan Sikand for contributions to software development; Sue Scott of Renewable Fitness for providing the exercises and her assistance in designing the exercise program; and Edmund Seto for contributions to the study design. This research was supported by the National Science Foundation (NSF) under Grant No. 1111965.